I was on the phone with Brad, a dealer from Texas, and he was explaining that running his business took so much of his time that he felt totally overwhelmed trying to figure out internet marketing. I’ve heard versions of this lament from many dealers, and it’s understandable. There are so many ways to promote your dealership on the internet that dealers can feel paralyzed when trying to decide where to focus their efforts. In fact, a big part of my job, as a provider of coaching and marketing services to dealers, is to simplify things. Help them cut through the digital jungle and help focus on a handful of strategies which will produce the most significant results, in the shortest time, for the least money. That leads to review websites. 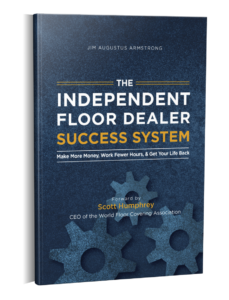 There are hundreds of them, and there is no way an independent dealer can effectively focus on them all. So let’s simplify things. In Figure 1, you’ll see that Google My Business has the number-one Alexa ranking. It’s not only the top review website, but it’s also the number one website period. That means every time someone Google’s flooring for your city the first reviews they will encounter — before Houzz, Angie’s List, Yelp, Home Advisor, or any others — are the reviews on Google My Business. And many consumers will go no further. They’ll base their entire decision on which flooring store to choose based on Google reviews. It’s absolutely critical that you focus on Google first. If I was forced to use only one review site, I would choose Google without hesitation. I’ve done online marketing assessments for a lot of dealers and, unfortunately, the majority have only a handful of Google reviews. Many of those are months or years old. You should have a system in place to generate a reliable, ongoing stream of positive reviews on Google. Once you’ve got your “Google game” up and running, then you can focus on some of the other sites. One thing to notice about Figure 1 is that some of the most popular review sites for dealers — like Houzz and Home Advisor — don’t appear in the top 10. That doesn’t mean you should ignore these sites. Yes, they get fewer visits, but those visitors tend to be people interested in home improvement services. So it’s a good idea to make sure your business profile is set up correctly with these sites, and have positive reviews there. But start with Google. Have you ever gotten a bad review unfairly? Have you ever had a competitor or an unreasonable customer leave a fake 1-star review? It happens all the time to dealers. If it hasn’t happened to you yet, don’t worry. It will. So stay tuned, because in my next column I’ll reveal how to fix that nasty problem. If you have any questions, or if you’d like me to evaluate your online reputation, email me.